Well, we are STILL waiting for Congress to get their act together to pass a Farm Bill and a federal budget. As of mid-December they still disagree on the Farm Bill. There were bills that were previously passed in both the House and Senate and sent on to a joint committee but nothing has come out of the committee since. Because of this inaction, the House had to again pass another extension to continue the existing Farm Bill until January 31st. This meant that Congress will be looking at this again at the end of January. The House passed this continuance as a stopgap measure to avert the threatened doubling of dairy prices. Apparently a sizable number of Senators oppose the extension of the 2008 farm bill which continues the ‘direct payment’ subsidies which they feel could trigger about $5 billion in direct payments. An interesting fact to note is that the new farm bill that they have been working on eliminates direct payment subsidies replacing it with crop insurance. The Democrats also feel that the threatened doubling of dairy prices or ‘dairy cliff’ is fiction. The Farm Bill also includes nutrition programs with includes the SNAP program, previously known as Food Stamps. The new farm bill is proposing cuts to the food stamps. Of course the Democrats in the Senate are opposed to these cuts and expansions so who knows what will be happening in January. We need all Grange members to contact their Congressman and Senators to let them know how unhappy we are that they have not finalized this bill. The initial bill expired in the fall of 2012 so Congress has been toying with the bill for almost two years. In mid-December, the House also passed a two year budget which would avert another government shutdown. The deal does set spending levels for the next two years which finally would stop the month to month extensions that they have been doing. Some political groups are complaining that this budget does not cut spending. It reportly does not make any major dents in the US deficit or deal with national borrowing authority. In early 2014 Congress will still have to vote to raise the federal debt limit again. 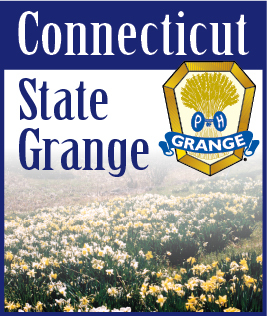 Connecticut sent five resolutions to the National Grange for action. One of our resolutions was adopted by the delegates and is now Grange Policy. They approved the resolution supporting the reinstatement and continuance of tours of the White House.